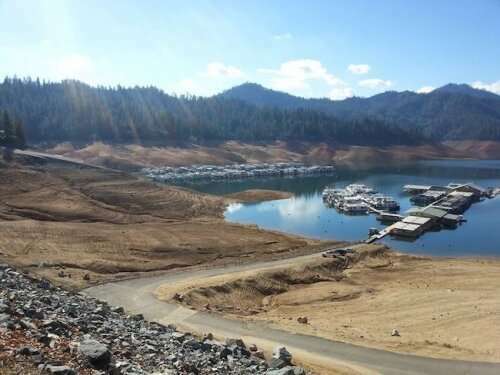 Lake Shasta, the largest manmade lake in California, was at 36 percent capacity when this photo was taken in January 2014. A new study shows climate change plus population growth are setting the stage for water shortages in parts of the U.S. long before the end of the century. Credit: USGS/Angela Smith. "The new study not only provides a best guess of future water supply and demand but also looks at what can we do to lessen projected shortages," said Thomas Brown, of the U.S. Forest Service Rocky Mountain Research Station in Colorado and the study's lead author. The study's authors looked at a variety of adaptive strategies for alleviating projected water shortages, like increasing reservoir storage capacity, pumping more water out of groundwater aquifers, and diverting more water from streams and rivers. Increasing the size of reservoirs does not look promising for fending off water shortages, especially in parts of the U.S. expected to get drier as climate change progresses. "Where water is the limiting factor, a reservoir enlargement is unlikely to store any water," Brown said. Further reductions in groundwater reserves and greater diversions of in-stream flows could help alleviate future shortages in many areas but come with serious social and environmental costs. If those costs are to be avoided, improvements in irrigation efficiency will need to become a high priority, and further transfers of water from agriculture to other sectors will likely be essential, the study's authors say. Climate is not the problem. The problem is draw downs of groundwater supplies and more demand than supply for surface water. California has tripled its population yet is depending on water dams built many decades ago along with huge draw downs in ground water which is not being replaced. None of that has anything to do with climate. The Midwest has a huge over draft problem in groundwater as does larges parts of the east and south. Unless we develop new water sources the problem is only going to get worse very fast. Desalination of sea water would solve the problem yet that solution is simply being ignored.